A Murray State player accomplished something that hasn't happened in the NCAA Tournament since 2012. Morant ended up with 17 points, 16 assists and 11 rebounds to lead four players in double figures. It was just the ninth triple-double since the NCAA started measuring the statistic in 1987. Morant's triple-double is the first in an NCAA Tournament game since Golden State Warriors forward Draymond Green had 24 points, 12 rebounds and 10 assists for Michigan State against LIU Brooklyn in 2012. Green had a total of two NCAA Tournament triple-doubles. 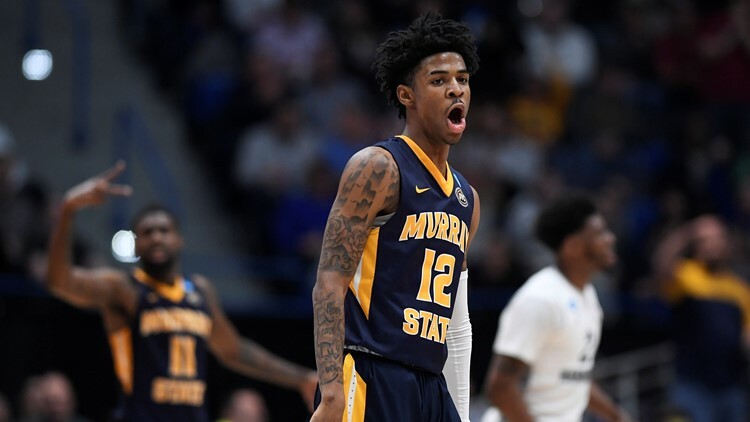 Murray State's Ja Morant (12) reacts during the first half of a first round men's college basketball game against Marquette in the NCAA tournament, Thursday, March 21, 2019, in Hartford, Conn.